In her memoir, published on the centennial of her father’s birth, Jamie Bernstein invites us into her family’s private world. 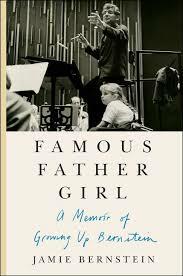 Famous Father Girl is an intimate meditation on a complex and sometimes troubled man, the family he raised, and the music he composed that became the soundtrack to their entwined lives. Jamie Bernstein is an author, narrator, filmmaker, and broadcaster. She is the co-director of Crescendo: The Power of Music, a documentary about youth orchestra programs inspired by Venezuela’s El Sistema model. In addition to The Bernstein Beat, an interactive concert modeled after her father’s groundbreaking Young People’s Concerts, Jamie has also written and narrated concerts for audiences of all ages about Mozart, Aaron Copland, and Stravinsky. This lecture is funded by the Friends of the Jewish Community Library’s Marsha Rivkind Raleigh Memorial Fund, named for a beloved Library patron and supporter. The talk will be followed by a reception.